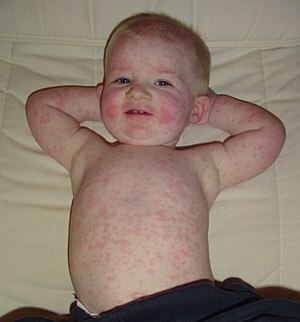 The Four-Year-Old was diagnosed with Fifth Disease last week. In my daughter’s case, the symptoms appeared as crankiness two weekends ago, and a rash that appeared on her cheeks last Monday and spread to her arms and legs last Wednesday. That’s it. Loyal readers will be glad to know that the Monday Night Sproing Cat Ballet Recital was held as planned. By the time the rash clued me in to the fact that she was sick, she was no longer contagious and back to feeling great. If Fifth Disease doesn’t win the prize for Most Literal Name in Medicine outright, it should at least be given an Honorable Mention. Turns out Fifth Disease earned its name because it was the fifth in a series of very similar-looking rashes to be identified by doctors. The rest of the series includes measles (Rubeola), scarlet fever (Scarlatina), German measles (3-day measles, rubella) and Dukes’ disease. Thank goodness The Four-Year-Old didn’t get any of those.